The Krishna Jungle Resort at the Kanha National Park, is owned and managed by Hotel Krishna, Jabalpur, a 3-star hotel rated as one of the best hotels in Central India. We, at the resort, maintain that standard of excellence of our well-known parent company. The Resort is open throughout the year. The Resort is situated just before the main entrance of the Kanha Park and provides visitors a truly exciting and rewarding jungle experience. The Resort is in 6 acres of thick forest. Elegant cottages, impeccable service, a well-planned itinerary and a refreshing gourmet experience await you here. 4-5 days at least for good wildlife sighting and tribal interests accessories, Clothes : Neutral khakis, greys and green clothes recommended. Carry camera, binoculars, sunglasses, and hats. The resort has total 18 elegant cottages with air-conditioning and heating arrangements to cater to vagaries of extreme climate. Large, airy and well furnished with an independent porch for evening chats. All rooms have attached modern bathrooms with 24-hrs hot and cold water supply. 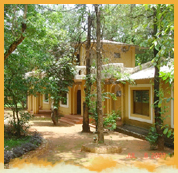 Krishna Jungle Resort is always there to welcome you. Our facilities are geared to match your smallest needs and convenience - your convenience. We love to hospitable and understand the meaning of holidays. The ambience makes you feel at home, right from the start. We meet and even surpass our guests' expectations. Above per night rates include Breakfast, Lunch and Dinner & Taxes will be extra.